I learned this past weekend that the tiring bit about moving lies more in unpacking than the actual shifting of things. I'm beginning to realize that I have way too much stuff but they're good stuff so I'm reluctant to throw them out, and the result is a sort of despair at all these nice but useless things I have piled up around me. But I know if I don't start getting rid of things my apartment would be just one step away from an episode of Hoarders, so I'm in the midst of taking photos for a blog sale. I have plenty of very gently used makeup waiting for new homes. In the meantime, here's a quick peek at my all time favorite Le Métier de Beauté eye kaleidoscope. I talk about Splendid Frost very often but I've never featured it here. I'm quite aware that a lot of you might hate me after this, because this is absolutely sold out everywhere. But pretty makeup is pretty makeup, and though it's from a couple of years ago, it still deserves to be seen. I've been asked if I could recommend dupes from the permanent line to recreate the kit, but sadly I couldn't think of anything similar. I also forgot what I wore on my cheeks, which is unfortunate because I'm kind of obsessed with it. Um, what? I am obsessed with whatever is on your cheeks, too. You must remember! OOO this is so pretty!!! One day or another I'll have to lay my hands on some Le Metier de Beaute especially now that it's available on Zuneta! LOVE the shades! And I'm with Larie, the blush you're wearing is lovely! Looking forward to getting my paws on your blogsale! Splendid Frost is really beauitiful on you. It's very sophisticated and love the bright blue along the lashes. I got the Saks On the Coast when it came out and the blue and the taupey khaki kind of looks similar (I hope?). Maybe I can scrounge up a grey and pink from another line and try to duplicate a look. That kaleidoscope is a beauty and you look gorgeous! So pretty! I really love the look overall that you're wearing and the eyeshadows look amazing! Ha, I had pretty much the same reaction browsing today's major fashion sales: my closet is full, ack! I even tweeted the idea of doing a blog sale before I read your post. Great minds think alike? Splendid Frost is lovely on you. I'm still grateful to you for yelling at me to get it while it was available. You never lead me astray! 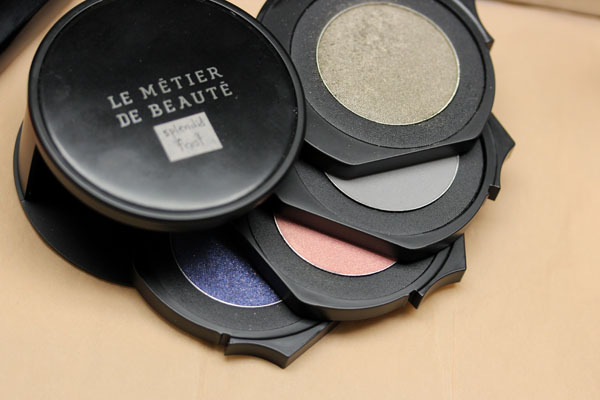 Le Metier de Beaute is very much out of my price point but it is a gorgeous palette, especially that blue/indigo! I hear you on de-hoarding!! BTW, do you consider selling the Penelope kaleidoscope kit? I'd buy it on the spot! I like the look, very sophicated. I really can't wait to see what you will have up for grabs in the blog sale. Do you know when you will post the information? Hi! Do u think you would put violaceous splendor on you blog sale? I've tried for years to find that one but it seems impossible. Though I to do not need any makeup, I am looking forward to your goods. :) Rainy days like today have me organizing my makeup. I may have a blog sale myself! Unfortunately, it is unlikely that I will put any of my lmdb kaleidoscopes for sale. I collect them so they're kind of like my babies >< so far I see lots of Chanel, Giorgio Armani, Shu Uemura, Guerlain... I'm going to try to photograph all of them this weekend and hopefully post it up by next week! Yep. That IS pretty makeup! 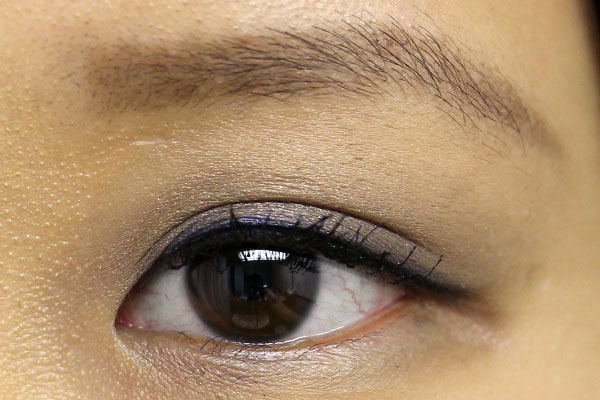 The midnight blue looks absolutely stunning Xiao...I must find a substitute to recreate! GORGEOUS CHEEKZ! I have this one!!! I need to pull it out-for some reason I tend to forget about it. I think I should depot it or something so I can use them more often! I'm so glad I took your advice and bought Splendid frost and Penelope when you discovered extras. I fell in love with them and then ended up buying the single shadow in corinthian. I do have to say the quality of the eye shadows is excellent. I love how you did your eye makeup using the blue as a liner. The whole look is gorgeous! Thanks for showing Le Metier De Beaute on your blog, without it I would still be lemming Penelope.